Here are some examples of recent fundraisers. They range from people substituting nets for wedding and birthday presents, small corporate initiatives through to events designed to supply nets to specific desired locations, which we have been able to accommodate. 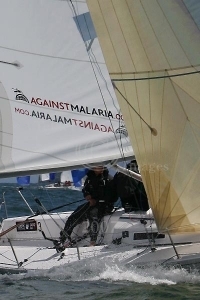 As part of the drive to raise awareness of the wider Against Malaria campaign we have been lucky to be able to 'sponsor' a J80 class boat which is competing in the J80 UK and World Championships. As with everything we do, we haven't had to pay for this sponsorship, it has been given to us by one of our trustees, Jonathan Calascione – a keen yachtsman. The UK national finals were held from 18 to 20 June off Plymouth and our boat, Against Malaria, skippered by Seb Ripard, came a very creditable fourth overall.For more information on the event see http://tinyurl.com/65xauf Against Malaria also came second in the Round the Island Race held around the Isle of Wight in the UK on 28 June. This is the largest race of its kind in the world and so a fantastic result. The World Championships are in Kiel from 7 to 13 July and we are getting a bigger logo for boat so we can make even more of an impact. We will keep you updated on progress at the World Championships and also get more on the story of the boat from Seb.